County of Derby: Hayfield, including Great Hamlet, Kinder, Phoside (4); Beard, including Ollersett, Whittle, Thornsett (5); Mellor (4). County of Chester: Disley (4). Later Additions: New Mills (1885), Newtown (1894). The population falling within the union at the 1831 census had been 9,493 with parishes ranging in size from Hayfield (population 1,859) to Beard (3,538). The average annual poor-rate expenditure for the period 1835-37 had been £1,500 or 3s.2d. per head of the population. The new Hayfield Board of Guardians met for the first time on December 7th, 1837. Moses Hadfield was elected as Chairman, Thomas Price of Disley as Vice-Chairman, and Ebenezer Adamson as Clerk. A Workhouse Committee was set up to formulate plans for the building of a Union Workhouse. Several potential sites were investigated and in November 1838, a piece of land on the west side of the road from Low Leighton to New Mills was purchased from Whitfield School, Glossop. Newspaper advertisements were placed requesting plans for a workhouse for 100-120 inmates. Those submitted by a Mr Worth were accepted, although in order to keep the cost under £2,000, a chapel and probationary wards were dropped from the design. The workhouse was erected in 1839-41. Its location and layout of the workhouse can be seen on the 1919 map below. The central block was three storeys high with two storey wings to each side which ended in two storey cross wings. Male inmates' accommodation was to the north, and female to the south. The central part of the building contained the dining room on the ground floor, together with Master's and porter's rooms, and male and female day rooms to each side. Above the dining room was the Guardians' board-room, with male and female dormitories at each side, and boys' and girls' accommodation in the attic floor above. Hayfield main building from the east, 2001. 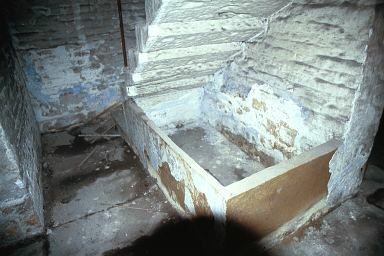 The workhouse had extensive cellars which included a number of stone troughs. These were probably used for storing food such as salted meat. Hayfield main block cellars, 2001. In 1867-8, additional buildings were erected including new male and female sick wards and, at the north of the site, work-sheds for stone-breaking and oakum picking. In around 1872, the vagrant cells at the north-east of the site were converted from a dormitory to separate cells. There were 7 cells for men and 5 for women. Hayfield vagrant cell block from the west, 2001. 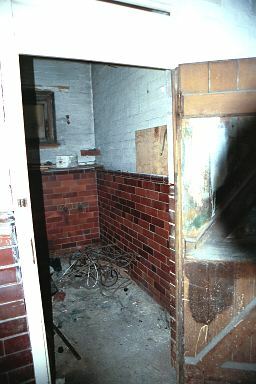 Hayfield vagrant cell interior, 2001. A new infirmary block was erected to the west of the main building in about 1902. Originally envisaged as a two-storey building, only a single storey was built except for nurses' accommodation above the entrance. Hayfield 18902 infirmary block the south, 2001. In 1906, a new board-room was erected at the south-west of the site. 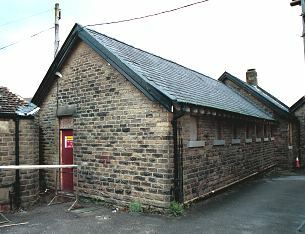 Hayfield rear of infirmary and new board-room from the west, 2001. Hayfield had mixed fortunes with its workhouse masters. In 1851, John Ratcliffe was forced to resign after having been absent for eight days and neglecting his duties. His successor, Job Harrison, a former asylum steward, was accused of hitting an applicant for relief. Although the Board of Guardians accepted Harrison's claim that it was lie, he subsequently appeared before local magistrates and given a fine which the Board paid. John Livesley, appointed in 1879, was said by one critic to be running the workhouse like a prison. One pauper was refused his dinner because he had worked three minutes less that the required two hours. Patients in the workhouse infirmary complained of being given inedible food and thick lumps of bread they were unable to chew. When Livesley retorted that he did not have enough butter to go round if the bread was sliced thinly, the Guardians ordered a bread-slicer to be bought. The most troublesome master and matron were Henry and Elizabeth Savage, appointed in 1897 and forced to resign in 1902. During their tenure, five successive nurses resigned because of Mrs Savage's interference. The master was found to be giving sick inmates short measure of medicinal alcohol, barring inmates from sitting in the yards of gardens, forcing them to wash clothes on Sunday, and generally being threatening and abusive. He was also found not to have been keeping the workhouse record books properly. The workhouse later became known as Hayfield Public Assistance Institution and then under the National Health Service as Ollersett View Hospital. In 2001, the site was redeveloped for residential use. Derbyshire Record Office, New Street, Matlock, Derbyshire. Few records survive. Holdings include: Guardians' minute books (1845-1930); Register of boarded-out children (1908-34). The Hayfield Union Workhouse by Joan Powell (1999, New Mills Local History Society).